From the wonder of the earth and sky to the ravages of fire and war, Ardent is an exhibition of handmade jewellery fuelled by the passions of its creators. Ardent is presented by five recent graduates from Vannetta Seecharran School of Jewellery. 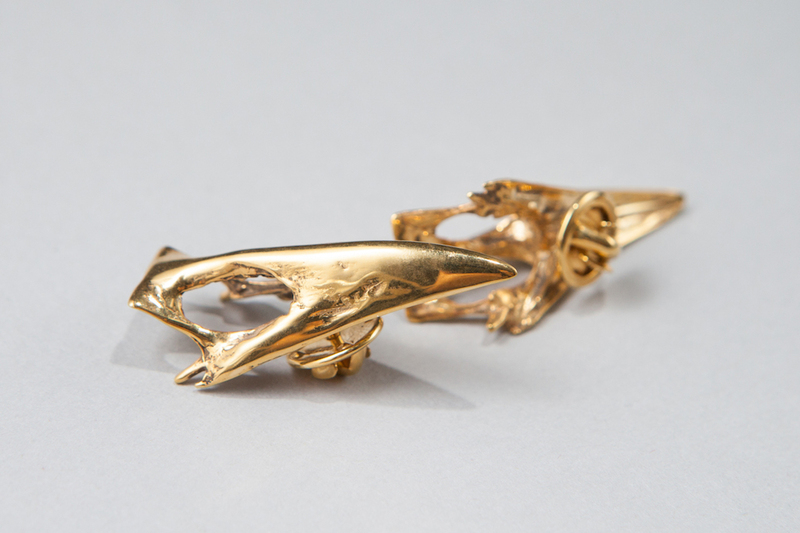 Driven by their love of designing and making jewellery with a message, since completing their course and exhibiting at New Designers, their work has been exhibited at Craft Central, Made London, Artistar Jewels in Milan and Joya Madrid and has attracted critical attention from Oh Comely magazine to The Times. Unique and dramatic, their work includes one-off pieces using precious and semi-precious metals and stones, hand-painted resin and metal-plated sticks and bones. Whether you prefer earrings or pendants, chokers or cuffs, these unusual and bold pieces will leave you in no doubt as to the power of jewellery. Jo Baker has a background in physics and astronomy that, combined with her interest in the American land artist Robert Smithson, has fed into her jewellery designs. Jo’s work has been featured in Joya Madrid and EspaiJoya Barcelona. Sonya Chauhan’s first collection All Burnt Out is inspired by the sudden act of combustion and the alchemical process of transforming matter. She explores the polarities of absence and presence through precious metals joined with contrasting materials from leather to enamel delicately bonded with gold powder. Deborah Crow casts toy soldiers in metal to create powerful images that comment on the cyclical nature of war. Work from her collection War Without Tears has been exhibited at Sun Pier House in Chatham, Joya Madrid and EspaiJoia Barcelona. Kimberley Ellison’s eco-conscious brand The Alkonost presents a stark warning about mankind’s carelessness with nature. Her beautiful but haunting work with bird skulls has been shown at Llantarnam Grange Arts Centre, Made London, London Edge and featured in Oh Comely and Creativ Paper magazines. Sally Vanderpump is inspired by the beauty of the sky. Her organic and experimental Radiance collection has been shown at Made London, Made in Clerkenwell, Handmade Edinburgh and Artistar Jewels in Milan and her rings have featured as “editor’s pick” in The Times magazine.